Nothing too special, but thought I would share them anyway. You'll note that as the company clung desperately to life in 1921/1922, their advertising become rather dull. Gone were the days of beautiful illustrations and interesting, eye catching designs. "Indorsement"? That was a new one for me. The OED (1993) lists it as a variant of "endorsement," but gives no history. Garner (2016) says that when used in the sense of publicly expressing approval, "endorsement" is the "only acceptable spelling." Fowler (1926) gives guidance no modern authority would give: he says that the use of "endorse" to approve anything other than a claim or an argument is an error. He gives no opinion on "indorse" vs. "endorse." 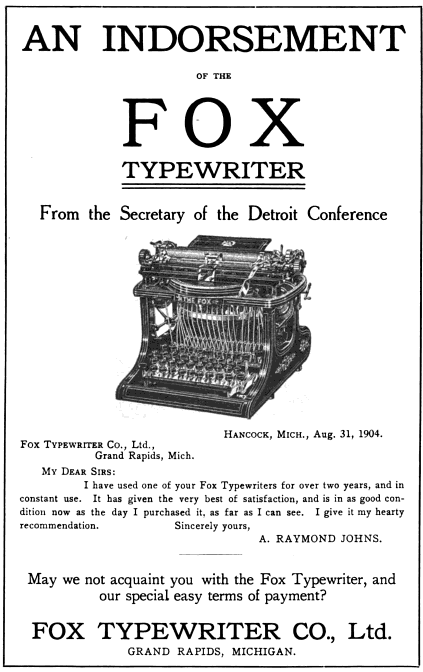 I have to say that these advertisements do make me want to try a Fox. Especially the bit about how little pressure is needed to strike a key. Fox machines are great, though it's rare to get one nowdays that is in good enough shape to truly allow the uber-light touch that they advertised. Indorsment is a word seperate from Endorsement, though more rarely used. It relates primarily to the signing of a financial instrument such as a check. As described in Whartons Law Lexicon (1892); "Indorsement: Anything written or printed upon the back of a deed or writing". Endorsement was interchangeable at that time. As time has progressed, endorsement has become the major term, and can be used in the same instances as Indorsement, but Indorsement can only be used in situations regarding financial documents. What I find interesting here is the claim that Foxes provide "12 to 15 years of good service." 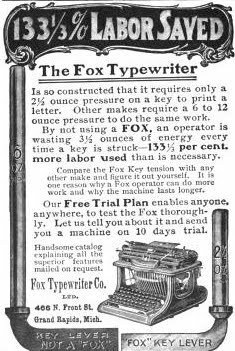 We often say that in the golden age, typewriters were made to last, but evidence for just how long they were expected to last by their manufacturers is very scarce. Of course, after 15 years the typewriter might have been reconditioned or rebuilt; still, it seems that no one was imagining that these machines could still be used a century after their manufacture. Yet, in many cases ... they can! Another Fox joins the Skulk.